English philosopher, born at Aller, Somersetshire, the son of Dr. Ralph Cudworth, rector of Aller, formerly fellow of Emmanuel College, Cambridge. His father died in 1624, and his mother then married the Rev. Dr. Stoughton, who gave the boy a good home education. Cudworth was sent to his father's college, was elected fellow in 1639, and became a successful tutor. In 1642 he published A Discourse concerning the true Notion of the Lord's Supper, and a tract entitled The Union of Christ and the Church. In 1645 he was appointed master of Clare Hall and the same year was elected Regius professor of Hebrew. He was now recognized as a leader among the remarkable group known as the Cambridge Platonists. The whole party were more or less in sympathy with the Commonwealth, and Cudworth was consulted by John Thurloe, Oliver Cromwell's secretary of state, in regard to university and government appointments. His sermons, such as that preached before the House of Commons on the 31st of March 1647, advocate principles of religious toleration and charity. In 1650 he was presented to the college living of North Cadbury, Somerset. From the diary of his friend John Worthington we learn that Cudworth was nearly compelled, through poverty, to leave the university, but in 1654 he was elected master of Christ's College, whereupon he married. In 1662 he was presented to the rectory of Ashwell, Herts. 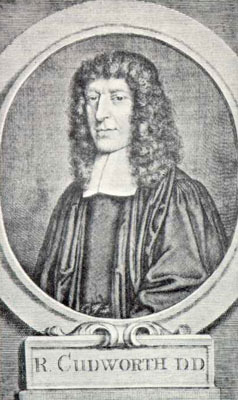 In 1665 he almost quarrelled with his fellow Platonist, Henry More, because the latter had written an ethical work which Cudworth feared would interfere with his own long-contemplated treatise on the same subject. To avoid clashing, More brought out his book, the Enchiridion ethicum, in Latin; Cudworth's never appeared. in 1678 he published The True Intellectual System of the Universe: the first part, wherein all the reason and philosophy of atheism is confuted and its impossibility demonstrated (imprimatur dated 1671). No more was published, perhaps because of the theological clamor raised against this first part. Cudworth was installed prebendary of Gloucester in 1678. He died on the 26th of June 1688, and was buried in the chapel of Christ's. His only surviving child, Damaris, a devout and talented woman, became the second wife of Sir Francis Masham, and was distinguished as the friend of John Locke. Much of Cudworth's work still remains in manuscript; A Treatise concerning eternal and immutable Morality was published in 1731; and A Treatise of Freewill, edited by John Allen, in 1838; both are connected with the design of his magnum opus, the Intellectual System. The Intellectual System arose, so its author tells us, out of a discourse refuting "fatal necessity", or determinism. Enlarging his plan, he proposed to prove three matters: (a) the existence of God; (b) the naturalness of moral distinctions; and (c) the reality of human freedom. These three together make up the intellectual (as opposed to the physical) system of the universe; and they are opposed respectively by three false principles, atheism, religious fatalism which refers all moral distinctions to the will of God, and thirdly the fatalism of the ancient Stoics, who recognized God and yet identified Him with nature. The immense fragment dealing with atheism is all that was published by its author. Cudworth criticizes two main forms of materialistic atheism, the atomic, adopted by Democritus, Epicurus and Thomas Hobbes; and the hylozoic, attributed to Strato, which explains everything by the supposition of an inward self-organizing life in matter. Atomic atheism is by far the more important, if only because Hobbes, the great antagonist whom Cudworth always has in view, is supposed to have held it. It arises out of the combination of two principles, neither of which is atheistic taken separately, i.e. atomism and corporealism, or the doctrine that nothing exists but body. The example of Stoicism, as Cudworth points out, shows that corporealism may be theistic. Into the history of atomism Cudworth plunges with vast erudition. It is, in its purely physical application, a theory that he fully accepts; he holds that it was taught by Pythagoras, Empedocles, and in fact, nearly all the ancient philosophers, and was only perverted to atheism by Democritus. It was first invented, he believes, before the Trojan war, by a Sidonian thinker named Moschus or Mochus, who is identical with the Moses of the Old Testament. In dealing with atheism Cudworth's method is to marshal the atheistic arguments elaborately, so elaborately that John Dryden remarked "he has raised such objections against the being of a God and Providence that many think he has not answered them"; then in his last chapter, which by itself is as long as an ordinary treatise, he confutes them with all the reasons that his reading could supply. A subordinate matter in the book that attracted much attention at the time is the conception of the "Plastic Medium", which is a mere revival of Plato's "World-Soul", and is meant to explain the existence and laws of nature without referring all to the direct operation of God. It occasioned a long-drawn controversy between Pierre Bayle and Le Clerc, the former maintaining, the latter denying, that the Plastic Medium is really favorable to atheism. No modern reader can endure to toil through the Intellectual System; its only interest is the light it throws upon the state of religious thought after the Restoration, when, as Birch puts it, "irreligion began to lift up its head." It is immensely diffuse and pretentious, loaded with digressions, its argument buried under masses of fantastic, uncritical learning, the work of a vigorous but quite unoriginal mind. As Bolingbroke said, Cudworth "read too much to think enough, and admired too much to think freely." It is no calamity that natural procrastination, or the clamor caused by his candid treatment of atheism and by certain heretical tendencies detected by orthodox criticism in his view of the Trinity, made Cudworth leave the work unfinished. A much more favorable judgment must be given upon the short Treatise on eternal and immutable Morality, which deserves to be read by those who are interested in the historical development of British moral philosophy. It is an answer to Hobbes's famous doctrine that moral distinctions are created by the state, an answer from the standpoint of Platonism. Just as knowledge contains a permanent intelligible element over and above the flux of sense-impressions, so there exist eternal and immutable ideas of morality. Cudworth's ideas, like Plato's, have "a constant and never-failing entity of their own", such as we see in geometrical figures; but, unlike Plato's, they exist in the mind of God, from where they are communicated to finite understandings. Hence "it is evident that wisdom, knowledge and understanding are eternal and self-subsistent things, superior to matter and all sensible beings, and independent upon them"; and so also are moral good and evil. At this point Cudworth stops; he does not attempt to give any list of Moral Ideas. It is, indeed, the cardinal weakness of this form of intuitionism that no satisfactory list can be given and that no moral principles have the "constant and never-failing entity", or the definiteness, of the concepts of geometry. Henry More, in his Enchiridion ethicum, attempts to enumerate the "noemata moralia"; but, so far from being self-evident, most of his moral axioms are open to serious controversy.